In this unit, we will explore some common algorithms for line following in a very systematic way, starting with well known “sequential” approaches, and then contrasting these with a “state machine” approach. We will see in detail how a four-step simple line follower with two Light (or Color) sensors works and how to systematize the design of its algorithm. We will analyze the similarity and fundamental difference with the three-step simple line follower typically used with one Light (or Color) sensor. 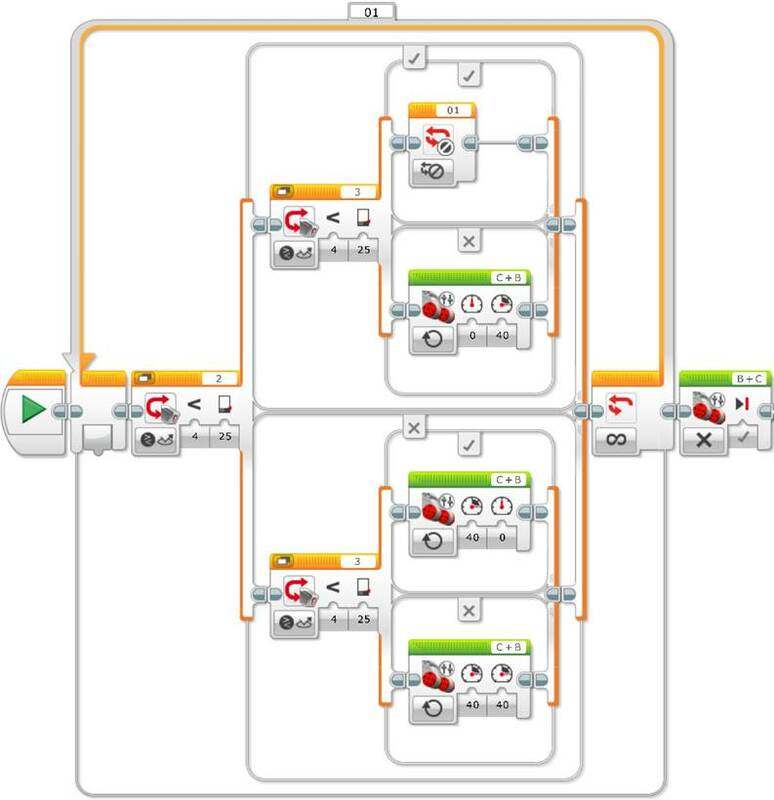 We will see how to make the robot take decisions sequentially at each line intersection, and how to design data flow diagrams to express graphically the working process of a program. Finally, we will see how to program a state machine for this line follower and the advantages it brings over sequential programming. 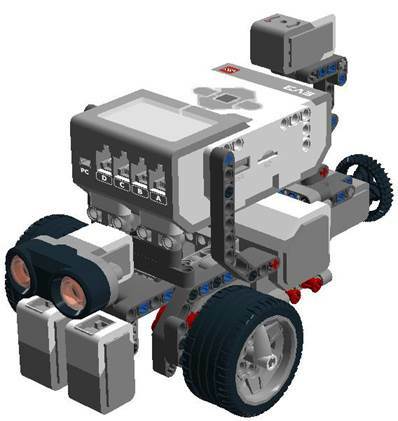 This unit is based on my “Teachers Introduction Course to LEGO® Mindstorms NXT & EV3” at BOGATECH’s website. 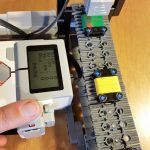 Here the programming examples are based on the LEGO MINDSTORMS EV3 Software, but at BOGATECH’s website you can find the NXT version and the differences between the two platforms, if you are interested. We can start by asking the students how they think we should conceptually proceed. How should we design the algorithm? Note that the two Light sensors are located on each side of the black line that we want to follow, as shown in the images below. Note: Although we will refer to Color sensors throughout this article, we are using them as Light sensors. 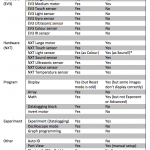 Of course, the approach described in this article applies equally well to an NXT robot with a Light sensor. What should the robot do when the two sensors detect (or “see”) the white color? By making the drawing it becomes obvious that robot has to go forward. And when the left sensor detects black and the right one white? It has to turn left. When the right sensor detects black and the left one white? It has to turn right. Finally, and before drawing the intersection, we can ask in what situation the two Color sensors of the robot will detect black. The answer is: in an intersection. Another more systematic, but less graphic, way to find all the combinations of the two Color sensors’ readings is to build a table of values. B = Black B B Intersection, stop the robot? We can ask the students how many combinations we would have with three Color sensors. The answer is eight which is equivalent to 23. In general we would have XY combinations, where X is the number of possible readings – in our case 2, that is, true if the reading is below the threshold between white and black and false if it is above – and Y is equivalent to the number of sensors, in this example 3 sensors. Next we can ask how to program this line follower? We can help the students by asking them how many different options we have. The answer is four, thus we will need a switch with four branches. How can we obtain these four branches? Well, we need to nest three switches. At the same time that we ask them these questions, it is important to represent this graphically on the board to help the students visualize the algorithm. An important point they need to understand is that the first switch needs to be associated to the first Color sensor and the other two to the second one, to obtain the four possible cases, as shown in the image below. At this point the programming is trivial, we only need to implement the previous pseudocode. Let’s say that the right-hand motor is connected to Port B, the left one is connected to Port C, the left Color sensor is connected to Port 2 and that the right Color sensor is connected to port 3. You will also need to check the right value of the light threshold between the white color of the field background and the black color of the line to follow (e.g. 25% in the following example), and that the Color sensor is configured to read the reflected light. Finally, you will also need to adjust the motors’ power to be less than 40% to obtain a smooth robot behavior when following the line. Create a new program, as shown in the following image. Note that with the motor blocks located one after the other –to start or to stop them at the same time, or to stop one and start the other one–, the program execution is so fast that it is like the two are run at the same time. 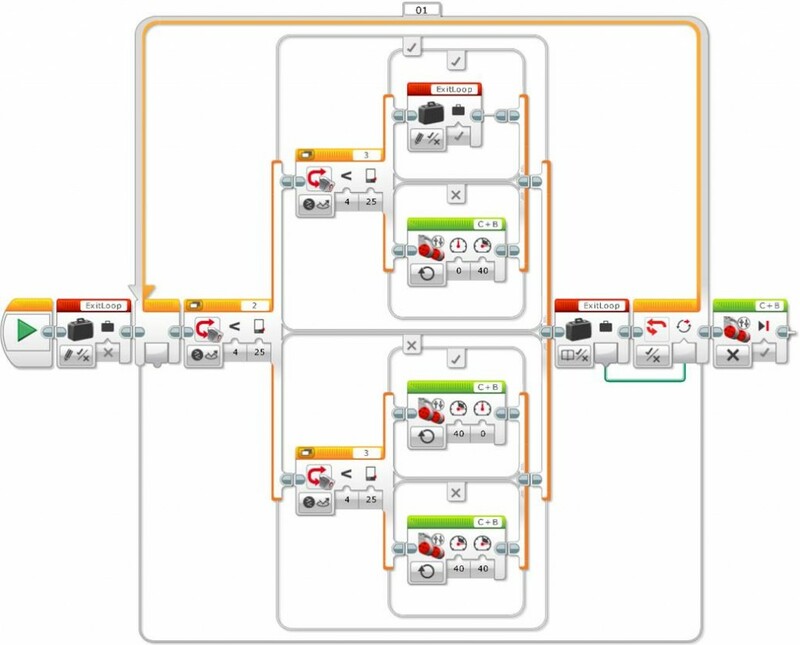 In the EV3 Software, the “Move Tank” block is a useful way to control the two motors at the same time with only one block. The image below shows how to simplify the previous program using this block. 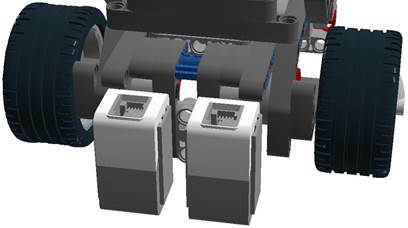 Tip: When using the “Move Tank” block you need to carefully configure the block’s motor ports, from left to right, in the same way the motors are setup in the robot looking towards the front (“Left Motor Port + Right Motor Port”). In our example, we need to configure the motors as “C + B” (and not “B + C”) because port C corresponds to the motor on the left and port B to the one on the right. We can also see that to brake a motor you just need to configure its power to 0. Finally, if the robot executes the program, what will be the robot’s behavior? The answer is that the robot will follow the line until the first intersection and once there it will stop and it will never get out of the loop. That is, the program will execute indefinitely (until the batteries will run out or until we will stop it). To demonstrate this, we can raise the robot and place it a little bit further away from the intersection, just after it, and we will see how the robot will start again following the line until the next intersection, etc. Next, we can compare the four step approach with the following three-step line follower that uses only one Color sensor, and ask the students what is the fundamental difference? As we can see, the three-step simple line follower with one Color sensor is an optimization of the two step simple line follower. To make it work properly, you need to make several tests to adjust the two thresholds with enough distant values (for the same Color sensor in EV3) to make the robot go forward in the straight segments and not to lose the line in the curves. Observe that the behavior of these algorithms to follow the line with one or two Color sensors is almost identical (maybe it is a little bit more precise with two Color sensors) because both algorithms execute one of three options. In the case of the line follower with one Color sensor, the robot turns to one side or the other and goes forward whenever the reflected light detected by the Color sensor is close to the threshold between white and black (i.e. when the sensor “sees gray”). In the case of the robot with two Color sensors, the robot goes forward when the two Color sensors detect white (i.e. when the black line is between the two Color sensors). Thus, the fundamental difference is that the robot with two Color sensors is able to detect line intersections! Then the question is: how can we get out of the loop? In general, when we use a loop the problem is always how to get out of it… One answer is to use a variable. For this, we need to convert the loop into a logic loop and use a logic variable to control the exit from the loop when finding a line intersection. In this example, notice that the logic variable initializes to false, that is, it is written to a false value before entering the loop, and it is only written to “True” when the Color sensors detect the black color to make the robot exit the loop. We can also see that the motors are stopped just after exiting the loop. We could have done this inside the switch, but as we will see later on, doing this outside the loop gives more flexibility. Observe that initializing the variable before entering the loop saves having to insert the variable three more times in each one of the other three switches’ branches, but with a false value. In addition, it makes it easier to read and understand the program. Some programming languages explicitly require initializing variables, but this is not the case with the EV3 Software. By default, a logic variable is initialized to false, a numeric variable to the 0, and a text variable to the empty string, “”. 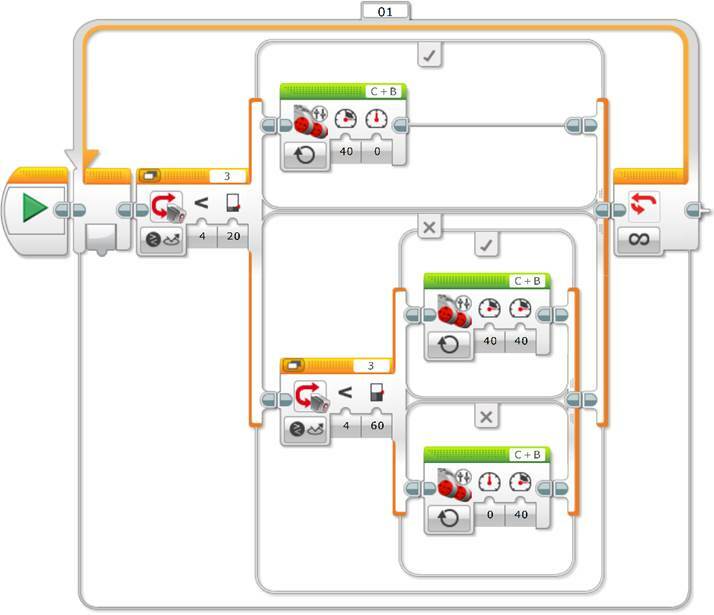 Finally, the EV3 Software has a “Loop Interrupt” block that provides a way of getting out of a loop, without having to use a variable, as the following image shows. Observe that the “Loop Interrupt” block needs to have the same name as the loop you want to interrupt. By default, loops are numbered when you add them to the program and their number can be changed. In our example, the loop is named “01”. Tip: It is a very good practice to always initialize the variables used, so as to make explicit their values and to make the code much more understandable. If you use a “Loop Interrupt” block, make sure that its name is the same as the loop you want to interrupt. In the case of long and complex programs it is very advisable to use descriptive names for loops, to better understand the code when you use the “Loop Interrupt” block. 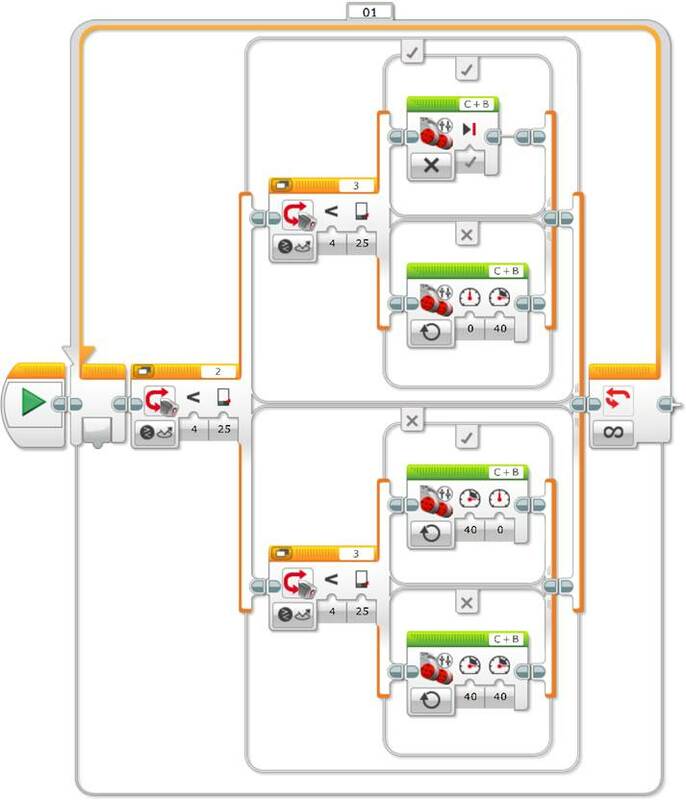 You can now build a small circuit with intersections and you can ask the students to program the robot to go forward at the first intersection, to turn left at the second, to turn right at the third and to stop at the fourth one. 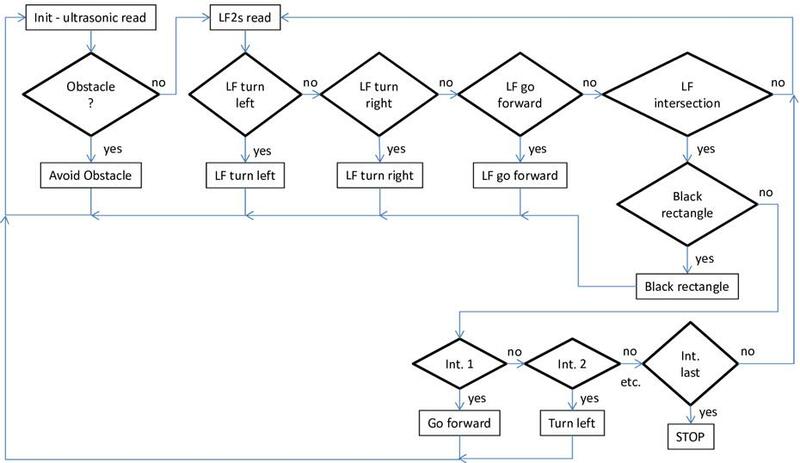 Perhaps the most obvious approach is that you only need to copy the previous code and program what the robot needs to do at each intersection, just after each loop exit. After the first intersection the previous programs use a Move Tank block to make the robot go forward 70 degrees, just enough to pass the line. At the second intersection the robot makes a point turn, in this case over wheel C, to turn left. We can see that, with a stopped wheel, if the other motor turns an equivalent to one rotation, given my robot’s geometry (yours might be different), this makes exactly one quarter turn, just what we need to continue following the line. At the third intersection, the robot turns over the other wheel to turn right, and at the fourth intersection the robot stops. At this point we see the usefulness of not putting the motor blocks to brake them and stop the robot inside the switch branch corresponding to the line intersection detection, this saves some code and allows concatenating the robot movements in a softer way without motor brakes. But even if this solution works perfectly well, what is its disadvantage? The problem is that the program is too long. The line follower code is duplicated four times, or as many times as intersections to negotiate. This implies that if we need to make any changes to the line follower, we will need to repeat it four times. In addition, the program needs to compile the same code four times, making the program less efficient and using a lot of unnecessary space in the robot’s memory. The following step is to create a subprogram or user block “LineFollower2s” for the code corresponding to the line follower that is duplicated four times in the two previous examples. Now the program is much more efficient and easy to understand, and the code corresponding to the line follower is only compiled or translated to the robot’s language once. In addition, if we need to make a change in the subprogram or user block, we only need to do it in the original program and when saving the change, this will propagate to all the instances or its insertions inside the main program. 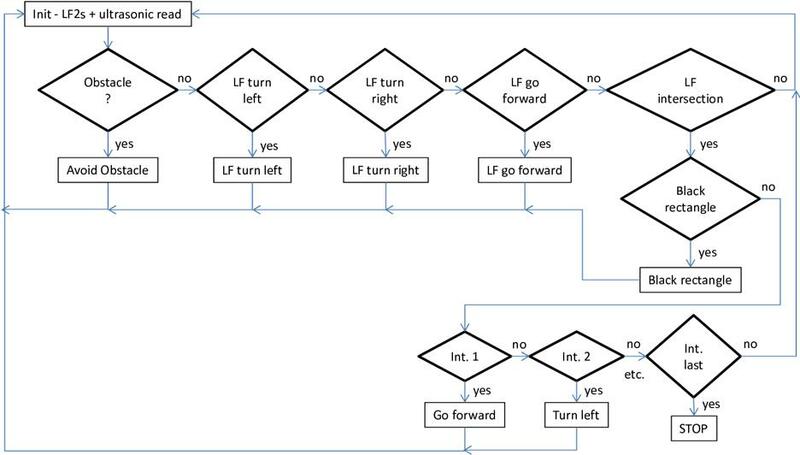 Finally, we can design a longer circuit to test the robot in taking decisions at each line intersection in a sequential way, following the flow or sequence of the robot path. The students have learnt designing algorithms in a graphic way, with pseudocode and in a systematic manner by using tables of values for each sensor. They have also compared the algorithms of the line followers with one and two Color sensors, and they have seen a sequential strategy to program the line follower robot with two Color sensors to make decisions at each line intersection. In addition, the students have seen the usefulness and efficiency of subprograms or user blocks to make the code more compact and more understandable and efficient, and they have learnt to use variables to pass information between different blocks or program parts, especially to get out of a loop by using a “Loop Interrupt” block. Challenge 1. Get to the end of the cage! This image shows the circuit of the challenge exercise to reach the end of the cage, where the arrows show the robot’s actions. The straight forward movements where the robot will have to follow the line are shown in black and the actions the robot will have to make in reaching the intersections are shown in red. Before starting, if pay attention to the exercise, we will see that we need six instances of the line-follower user block and between each instance we need to turn left, go over the middle line of the field, turn right, turn right again, go over the middle line again, and stop. Tip: To make the robot easily detect intersections and even right angles, these need to have a cross shape (“+”) as shown in the above image. This might not be necessary, it will depend on the robot’s geometry (distance of the sensors to the wheels turn axis and distance between wheels) and the speed of the motors when following the line. The previous programming style is perfectly correct, the blocks and decisions are programed in a sequential way following a specific order, for example, following the order in which the robot encounters the intersections, following a specific reading order of the different robot’s sensors, and finally taking actions in a specific sequence of decisions. 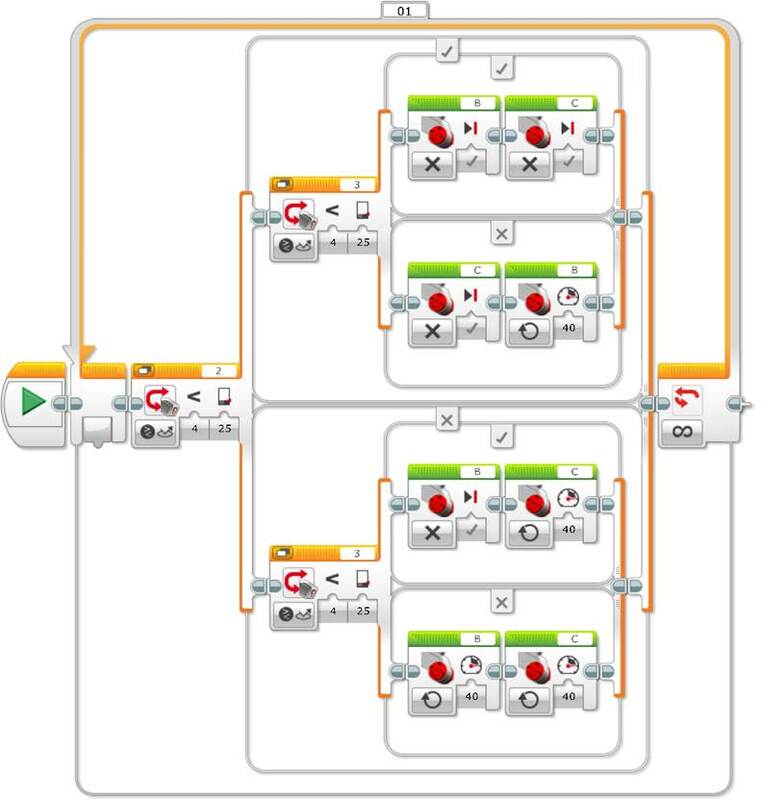 In the EV3 Sofware the sequence beam establishes the program blocks execution order. Sequential programming is one of the most common and often more obvious programming styles, because if the program is not very complex, you can write it without any planning, but it is not always the most efficient, most flexible or most understandable style in the long run. What happens if we have to change the order of intersections, the order of the sequence? What happens if we have to repeat several times one or several sequence components, for example, to repeat several turns to one side, or to go forward on several different lines of the path? What happens if we have to execute a sequence part only when a specific condition is met, for example, if we have to add a third ultrasonic sensor to make the robot avoid an obstacle in the middle of the path? What happens if we want to stop the execution of the program immediately when a specific condition is met and we do not want to wait until the rest of the sequence is finished? Can we improve the sequential programming of the simple “four step” line follower with 2 Color sensors and make it more functional, more compact and even better understandable? The answer is yes, by using a “state machine”. The state machine programming model is a very common and useful model that allows implementing any relatively complex algorithm, which can be represented by a data flow diagram with its decisions making processes and its resulting actions. A state machine (or finite state machine) is based on a series of states with a transition function that sets the next state to take. Each state contains an action to take and a transition code that calls the next state. Often the programs or applications require an initialization state, followed by a default state – where, for example, the sensors are read to make decisions and to call other states or to take different actions – and finally, it can have a closing state to take cleaning actions before finalizing the program. 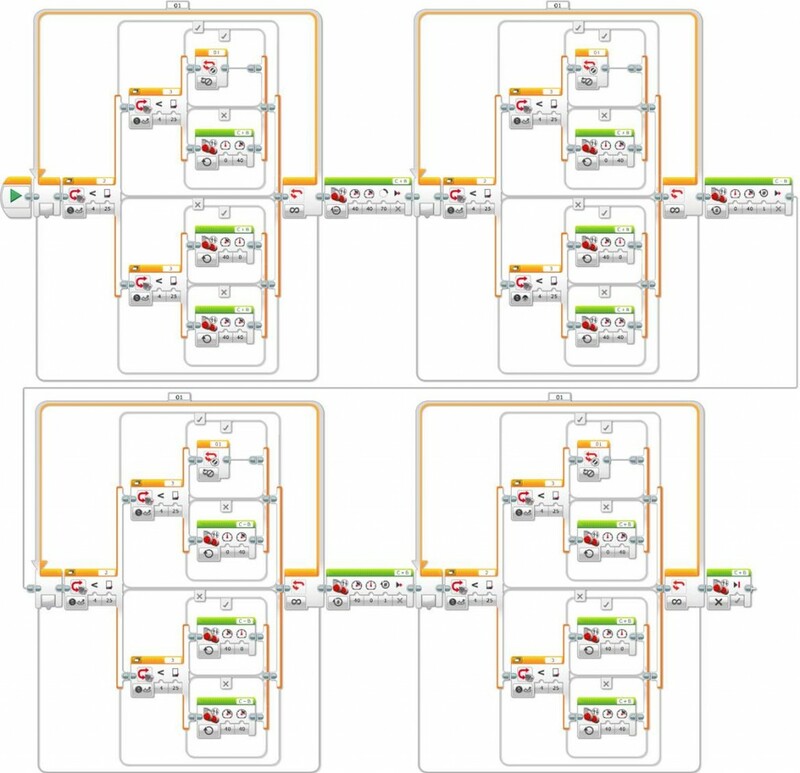 In the EV3 Software we can create a state machine with a loop, a case structure (or multiple Switch, where each case represents a state), a variable to store the transition information between states at every iteration of the loop, a functionality code for each state, and a transition code that determines the next program state. To get out of the loop, we only need to add the “Loop Interrupt” block in the finalization state of the unlimited loop. Finally, we can define the state machine’s default case to the initialization case. In the following example, the state machine structure has four cases represented by the four tabs: “Initialization”, “State 1”, “State 2” and “Finalization”. We can start by asking the students how many states they think the state machine of the four-step simple line follower with two Color sensors will have. It is very probable that they will say four states, one for each case or step of the line follower, that correspond to each one of the actions, which are, to go forward, to turn to one side or to the other side, or to get out of the program when reaching a line intersection. The first point to consider when creating a state machine is to separate the decisions from the actions that the program needs to take. In this way we need to separate the sensors’ reading from the actions that the line follower will have to take at every loop iteration. Thus, a first state, that could be the initialization state, will correspond to the reading of the two Color sensors that will determine what will be the next state to execute. This next state will contain the action that the robot will have to do, meaning the functionality code, and it will call again the initialization state to read again the sensors, meaning the transition code. The state corresponding to the case when the robot finds a line intersection allows it to get out of the loop, which means to get out of the program, as it is shown below. The answer is: because they correspond to the reading of the sensors (the functionality code) and not to the state that we are really interested in calling in the program’s state machine (the trasition code between states). In other words, after obtaining each different combination of the light or color sensors, in our case, “WW”, “WB”, “BW” or “BB”, we need next to call the adequate state, in our case, “LF go forward”, “LF turn right”, “LF turn left” or “LF intersection” respectively. This is done by using a second case structure or multiple switch that, in our example, reuses the same previous text variable to store the resulting state for each case. This example is very simple, but further on we will see the usefulness of this methodology, that makes the program much more understandable and self explanatory. The students have learnt to design a state machine and to understand how to take apart the decision making process of the program from its actions, to understand the difference between the functionality code and the transition code between states, and to understand the differences between the sequential programming and the states machine programming style. The next step is to modify the previous state machine to make the robot capable to make the adequate decisions to negotiate each line intersection of the path. We can ask the students how to do it? The answer is that the state machine should be able to count intersections and depending on the intersection number take the correct action, that is, go forward to surpass the line, turn to one side or to the other, or brake the motors and exit the program. Now we can ask the students again where to place the intersections counter and how to program it? It is obvious that the robot will have to count the intersections that it encounters through the path when both Color sensors detect black and that we will have to add a numeric variable to store this number. In terms of programming, we will need to add a special state to count intersections and to decide what state to call for each one of these, and four more states for the four possible actions, previously mentioned, that the robot will have to do at each intersection (to go forward to pass the line, to turn to one side or to the other, or to brake the motors and exit the program). When we write a program we do not usually start writing the code directly, we need minimum planning, especially if the program is at all complex. Even before writing a pseudocode, it can be helpful to create a data flow diagram. A data flow diagram (DFD) is a graphic representation of the data flow through an information system that can be also used to visualize the data processing. In our case we can use it to visualize and graphically differentiate the program parts that read data, the parts that make decisions from reading the data, the parts that do the actions according to each decision and the program’s data flow that connects all the previous parts. If a data flow diagram is well done writing the code can be very simple. Data flow diagrams can be represented in several ways and with more or less detail. In our case, we will represent the actions with a rectangle, the decisions with a diamond and the data flow with an arrow. Every time a decision is made we will inform the arrow that goes out from the diamond about whether the decision corresponds to a “yes” or a “no”. As we can see in the above data flow diagram, the upper rectangle “Init – LF2s read” reads the light or color sensors data. Next, in function of the sensors’ reading, decisions are made (represented by diamonds) about what actions to call. Finally the adequate actions are called, that are shown in the lower rectangles. After each action the initialization state is called again until the system detects the last intersection and exits the program. It is very important to note that the case “LF intersection” counts the intersections and for each one of them it establishes the next case to execute in the state machine by means of the text variable. In other words, it does not execute anything, it only makes the decision. This is very important because when doing the challenge exercise with the state machine we will see that we can have several intersections with the same required action and this methodology avoids duplicating the code, systematically setting apart the decisions from the actions. Challenge 2. Get to the end of the cage using a state machine! Before starting we can copy the previous exercise and give it a different challenge exercise name. Next we can ask the students what needs to be changed in this program to do this challenge exercise. 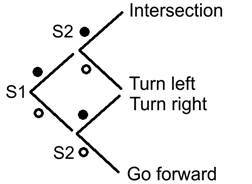 The answer is that we only need to change the structure of the cases defining the state we need to call for each intersection number, which is inside the “LF intersection” state (1: left turn, 2: go forward, 3: right turn, 4: right turn, 5: go forward and 6: exit). As we can see, the modification is trivial. The students start realizing the big advantage of systematically separating the program decision making process from the actions in the design of a state machine, that this avoids duplicating the code and makes it much more understandable and self explanatory, more compact, more efficient and much more flexible to introduce changes in the future. Once all the states containing all the possible program actions are written, we only need to program the decision making states and the transitions, which is where the program intelligence lies. The students have also learnt to generate data flow diagrams to graphically represent the program flow. Even if we can use a numeric variable to name every state, the advantage of using a text variable is that the program is much more understandable, self explanatory and does not need comments. Next, we can add a little bit more of complexity and interest to the previous states machine with the two following examples. The challenge of this exercise is to create a black rectangle on a straight line in the middle of the path and make the robot capable of differentiating this rectangle from an intersection. In addition, we can make the robot say the word “black”, when it finds the black rectangle, and make a different sound at every intersection to show the ability of the robot to recognize intersections and differentiate them from the black rectangle. What do we need to modify and add to the previous state machine program to make the robot detect the black rectangle? The answer is that when the robot detects the intersection, we need to add code that will allow differentiating an intersection from the black rectangle. 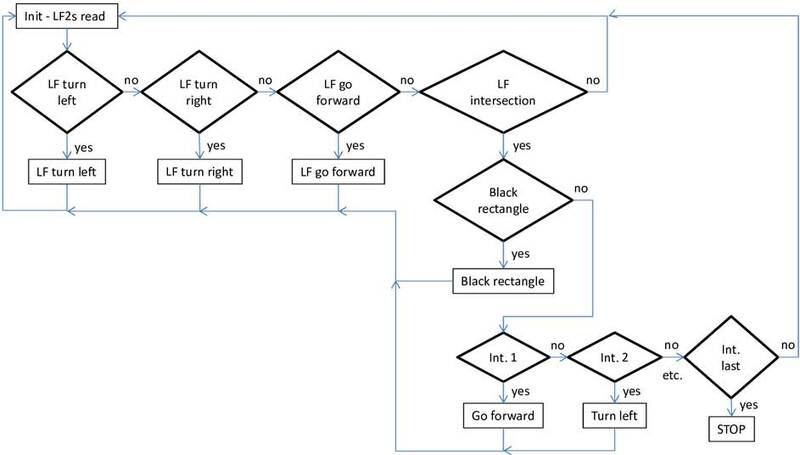 The following data flow diagram shows the change we need to make to the previous program to differentiate the black rectangle from a line intersection. Now we need to program the code that will allow the robot to differentiate a line intersection from the black rectangle. How can we do it? 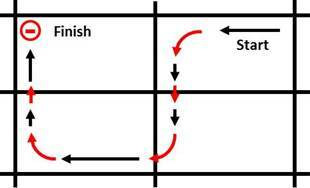 We can start by asking the students what differentiates the black line from the rectangle? The difference is obviously the width! So what can we do to make the robot detect this width? A good option is to make the robot go straight forward when detecting an intersection until one of its Color sensors detects the white color. If in addition, the robot counts the rotation degrees of one of its motors (both turn equally) then we will be able to see that the rotation degrees are much lower on the intersections than on the black rectangle. Remember to create a new program by copying the previous program before starting modifying the code. The “rectangleOrIntersection” state is executed just after the state machine detects an intersection. We can see that the code starts by initializing Motor B rotations counter, then starts both motors and, using a loop, it waits until one of the two Color sensors detects the white color, to finally set the state variable to “rectangle” if the rotation degrees of Motor B are bigger than 70 or to “LF intersection” if they are lower. Finally, we only need to change the initialization state variable to the value of “rectangleOrIntersection” for the case “BB”, we also need to create a second state in the states machine called “rectangle” to make the robot say “black” and to call the initialization state, and we need to add another sound block to the “LF intersection” state to make the robot do a different sound from the rectangle one at every line intersection. A final exercise can be to add an obstacle in the middle of the path and program the robot to detect it, negotiate it, and continue its path without crashing against it. To solve this challenge, the students need to realize that the robot will have to use a third sensor, the Ultrasonic sensor. Thus, what are the minimum changes we need to do in the previous program to solve this challenge and where do we need to add them? Basically, we will need to change the initialization state by adding a code for the Ultrasonic sensor. Then, when the ultrasonic sensor detects an obstacle, it will call a new state, “obstacle”, to make the robot go around the obstacle, and if does not detect any obstacle it will call one of the previous states. Alternatively, we can create a specific state for the Ultrasonic sensor reading and convert it into the initialization state, which means that we will call it before calling the decision making state corresponding to the light or color sensors. If this new state detects an obstacle, it will call the “obstacle” state to negotiate the obstacle, and if does not detect it, it will call the Color sensors’ reading and decision making corresponding state. Before starting to write any code, we first need to design a new data flow diagram and we can do it for the two previous programming strategies. Before starting to write the program, remember to create a new program by copying the previous one. Given that we will make two versions of the same program, make two copies and name them differently. As we can see in the previous images, in terms of programming we only need to add the Ultrasonic sensor reading to the “Initialization” state, by using a Switch associated to this sensor with a threshold less than 20 cm, and we need to add another case to the case structure it contains, for the Ultrasonic sensor obstacle detection (new case “U”), and put the value “obstacle” to the state machine variable. In terms of programming style, note that the switch associated with the Ultrasonic sensor is located just after the Color sensors reading, allowing us to modify the variable only in the case of an object detection and avoids nesting switches, to maintain the sequential sensors reading, which is much easier to understand and to maintain. Finally, we need to add a new state “obstacle” to the state machine, for the robot to negotiate or go around the obstacle and continue to follow the path line. 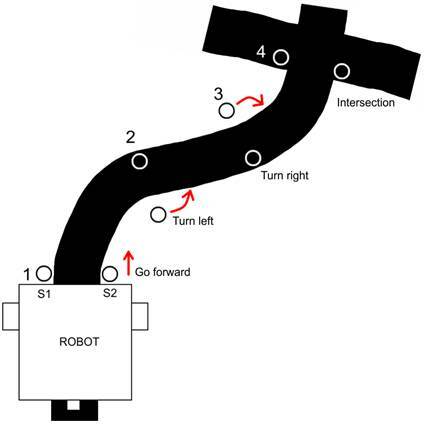 This code is very simple to write, the robot only needs to turn to one side, go forward until surpasses the obstacle, turn again to the opposite side, and go forward until reaching the line once again (it is very advisable to use the Color sensors to detect it so as to reach it with precision), and finally rectify the robot by making a small turn inverse to the previous one just before continuing to follow the path line. The difference between this second version and the first one is that we need to rename the “Initialization” state to “LS reading” (Light or Color sensors reading) and add a new state “Initialization” to the state machine to put the Ultrasonic sensor reading. In this new “Initialization” state we just need to add the state machine variable with the “obstacle” value, when the ultrasonic sensor detects an obstacle at less than 20 cm (like in the previous version), and with the value “LS reading”, when it does not detect any obstacle, to make the robot follow the line. Finally, like in the previous version, we also need to add the same new case “obstacle” to the state machine, for the robot to negotiate or go around the obstacle and continue following the path line. What is the advantage of these two programming methods to negotiate or go around an obstacle? The principal advantage is that the obstacle can be placed anywhere in the path, something that would be more difficult to accomplish in a sequential programming. We need to be careful with the programming code to avoid (or go around) the obstacle and come back to the path line, especially if there are several obstacles and if these are located in a curve, or in a straight line, or if there are walls in the path that prevent avoiding the obstacle from any side, etc. With this unit the students will understand the data flow diagrams in some detail, the usefulness of state machine programming and its big advantage over sequential programming, by means of relatively simple examples, which include decision making using sensors, counters to accumulate information, and variables to pass information between blocks and program parts. This unit can be especially useful to initiate young students’ teams that would like to participate in educational robotics competitions, like the rescue challenge of the RoboCup junior.